Traditionally, Russian industry was dominated by small workshops based in the countryside and, in contrast to Western Europe, there were few industrial towns. Moscow and its surroundings were the oldest centre of industry. Alongside Moscow, Tula was the main centre for metalworks and Ivanovo was the major centre for the textile industry. During the reign of Peter the Great two major industrial regions were developed: St. Petersburg and the Urals. The latter quickly became the greatest heavy industrial region of the country and the major centre for production of iron and copper. Another important distinction between the towns of the Russian Empire and Europe was that in Russia wood remained the main domestic and industrial fuel until the mid-19th century. Although the practice of burning wood depleted forests in European Russia and the Urals, urban smoke was not as hazardous as in the West. The Industrial Revolution, accompanied by development of large industrial cities, began in the Russian Empire at the second half of the 19th century, a hundred years later than in the leading European countries. A dynamic industrial transformation took place in Moscow and St. Petersburg which by 1900 had evolved into large, urbanized industrial metropolis specializing in metal-working, textile and chemical industries, production of paper and printing. Industrial and urban development occurred in the periphery, particularly in the Baltic region (e.g., Riga, Narva, ports of Revel, now Tallinn, and Libau, now Liepaya) and in the south (e.g., the Ukraine, Odessa, and Rostov-upon-Don). In the Baltics, the main industrial centre was Riga where textile manufacturing, machinery construction, and later chemical and rubber industries prospered. A massive growth of iron and steel industry occurred in the Ukraine in the triangle formed by Krivoy Rog, the northern coast of the Sea of Azov and Kharkov. The major development began in the 1880s, when the iron mining district of Krivoy Rog and the manganese mining district of Nikopol were connected by rail to the Donetsk coal basin (Donbass) and the major industrial agglomeration of the Russian Empire was formed (Figure 21.3). By the end of the 19th century, the Ukraine in terms of its metallurgical industry was comparable to the major industrial nations of Europe and the steel-producing regions of the eastern United States (Blackwell, 1983). The oil industry developed in Transcaucasia where the existence of vast petroleum resources on the Apsheron peninsula provided for the location and growth of the Baku industrial region in the 1860s. By the turn of the century, the Baku region was producing half of the world's oil and the city of Baku had a population of over a million (Blackwell, 1983). Although the 1917 Revolution disrupted economic development, the growth of industrial regions formed by 1917 continued during the Stalinist industrial drive of the 1930s. The largest alteration in industrial geography by the Soviet state was a massive transfer of heavy industry to the east. There were two reasons behind this: first, proximity to mineral, water, and energy resources that are concentrated mainly in the Asiatic part of the country and second, an attempt to remove industrial facilities away from the national borders in the anticipation of military invasion both from the west (Germany) and the east (Japan). Energy generation and production of metal and machinery were central to the campaign of transformation of the USSR into a modern industrial society and the projects were invariably extensive. 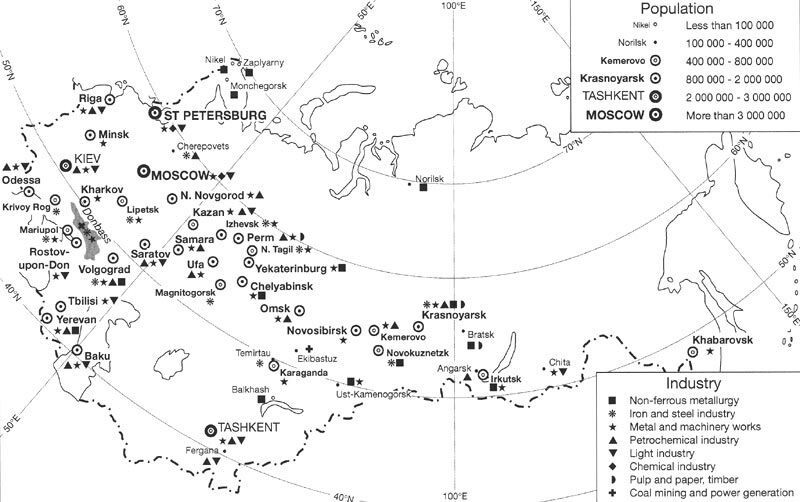 The metal-producing Urals region, which fell into decline during most of the 19th century, was redeveloped with the major metal works concentrating in the cities of Magnitogorsk, Sverdlovsk (now Yekaterinburg), Chelyabinsk, and Perm (Figure 21.3). The Kuznetsk coal basin (Kuzbass) and later the Kazakhstan regions of Karaganda and Ekibastuz supplied coal. The shift of coal mining and production of metals reached Lake Baikal in the east and the Taymyr peninsula in the north (where nickel and copper were mined and processed by the Norilsk Metallurgical Combine). The overriding goal of the Soviet state in the first half of the 2()th century was the industrialization of the country in the least possible time and at the lowest possible cost. This goal was achieved: while in 1928, the Soviet gross domestic product (GDP) regained the 1913 level of that in the Russian Empire and constituted only 2 7 per cent of the US gross national product (GNP), by 1940 it reached 42 per cent of that of the US GNP (Ziegler, 1987). The Soviet industry was organized around five-year, annual, and monthly plans and completion of task by the deadline was compulsory. Time constraints implied that industrial planning was far from thoughtful and careful. Capital available for industrialization was small and funds were allocated for new production facilities and not for pollution abatement. In short, environmental impacts were not a priority. Similar to many in the 19th century Europe and North America, the Soviets associated smoke with industrial growth and prosperity. Commenting on the official and popular perception of pollution in the 1930s-1970s, Ziegler (1987) notes that central to the Soviet understanding of pollution were boundless beliefs that it was a temporary problem which technological achievements would allow one to resolve in due course. The expansion of industry in the second half of the 20th century was mainly into the oil- and gas-producing regions of the Volga-Urals oilfield, Western Siberia, and the European north-east. Metallurgy was developed in the cities of Central Asia (e.g., Fergana), in the region of the Kursk Magnetic Anomaly (e.g., Lipetsk), and in the Kola peninsula (towns of Nikel, Monchegorsk, and Zapolyarny). By the 1970s, the areas of environmental and, most notably, air quality calamity had been formed (Figure 21.3).